Rosie Revere is no stranger to flops and fails, kerfuffles and catastrophes. After all, she's an engineer, and engineering is all about perseverance But sometimes, Rosie has a really important project to tackle-one that feels much bigger than herself. When Rosie's beloved Aunt Rose and her pals the Raucous Riveters-a gaggle of fun-loving gals who built airplanes during World War II-need her help, it's up to Rosie to save the day. Will Rosie be able to invent a contraption to help one of the Riveters paint in the annual mural competition? After one flop...then another...and another...Rosie starts to lose hope. 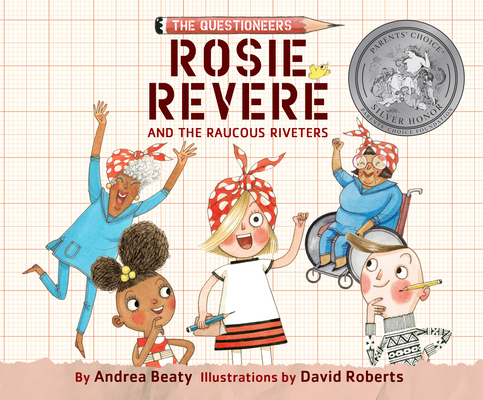 But thanks to some help from her classmates Iggy Peck and Ada Twist, Rosie creates the Paintapolooza and, along with the Riveters, rediscovers the meaning of home.